When you start to fly there are a number of regulatory hoops through which you will need to jump before acquiring your pilot's licence. Whilst you can begin to fly as soon as your legs are long enough to reach the rudder controls and see over the cowling at the same time you cannot log your flying hours until you reach the age of 14 years. Solo flight is possible from the age of 16 years and the minimum age for the issue of a Private Pilot's Licence (PPL) is 17 years. There is no upper age limit. Provided a pilot can continue to obtain the necessary medical certificate, he or she can continue to fly regardless of age. The CAA has appointed an army of authorised medical examiners who are approved to conduct aviation medicals and issue the appropriate certificates. For flying at PPL level a Class 2 certificate is required (a class 1 certificate is required for professional flight crew). The CAA publishes a list of authorised medical examiners on their web site. 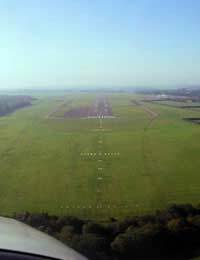 Whilst you can start to fly without a medical, a certificate does not become mandatory until you fly solo, student pilots are well advised to attend to this matter early in their training. Medical certificates are valid for variable periods dependent on the age of the pilot:Under 30 years of age the medical certificate is valid for 5 years, reducing to 2 years for pilots from the ages of 30 - 49. Once over the age of 50 an annual medical is required and this reduces to a 6 month renewal requirement over the age of 64. As an aside, authorised medical examiners tend to be busy so do not be tempted to leave booking your appointment until you are reaching the solo part of your flying training. You could have to wait 3 - 4 weeks before you can obtain your medical certificate. A minimum of 45 hours flying time is required for the issue of a PPL. A minimum of 25 of these hours will be under dual instruction and a minimum of 10 hours will be solo flight. The remaining 10 hours can be either solo or dual flight or a mixture of both. Of the 10 solo hours, 5 must be spent flying cross country, which will include a qualifying cross country flight of at least 150 nautical miles with two away landings. A triangular route is flown. Passes in all 7 of the theory subjects is required. The examinations are in multiple-choice format and are not difficult provided the student pilot has read the appropriate training material. Some student pilots choose to learn enough about flying to pass the exams, others choose to learn about flying. There is a distinction. I'll leave it to you to work out which is the better pilot. All of the exams must be completed within 12 months of the first pass. All flying training must be completed within 24 months of the first pass. The pass mark is 75% on each paper. Theory exams must be taken at a JAA registered exam centre and it is worth looking for a flying school or club that is so registered, for all of your flying training. It makes good use of time if weather restricts flying activity as you can study for and sit an examination instead. A student pilot must have passed the Air Law examination before undertaking any solo flight and it is worth obtaining a pass in the R/T exam at the earliest opportunity. There is a practical R/T test to be taken and slots for these can be booked weeks in advance. This is the flying part of the test procedure, which students undergo when they have logged their flying hours and completed all ground examinations. There is a general aircraft handling part to the test and a navigation section. Most flying schools will not allow students to attempt the skills test until they are ready. It is not a test that simply happens at the 45 hour mark. Having completed all of the requirements for the issue of the PPL the flying school or club will issue the student pilot with a certificate, which must be submitted to the CAA along with the flying log book and licence application. It can take up to 3 weeks for the PPL to be returned. As the holder of a shiny new PPL you are permitted to fly as pilot in command (PIC), or co pilot, of any flight in an aircraft of the type specified on your licence. You are not allowed to receive payment for flying. All flights must be conducted in VMC (Visual Meteorological conditions). Flying with an examiner and undergoing a proficiency check within the 3 months immediately prior to revalidation. This is a flying test of approximately 1 hour that looks to check general handling skills. Flying experience of a minimum of 12 flying hours flown in the 12 months prior to revalidation of which 6 hours were flown as PIC. There will need to be log book evidence of 12 take offs and landings ( A good pilot always has the same number of each!). In addition there must be a dual flight with an instructor of a minimum of 1 hour. It may seem as if PPL requirements are difficult but, in fact, they are straightforward and your flying club or school will make sure your licence is valid before allowing you to take one of their aircraft. It is very important that aircraft owners keep an eye on the periods of validity of their licence as there will not be the same checks in place.